Dell has a new Venue on the way, though the name is resurrecting in an all-new form. Once reserved for and then dropped when Dell stopped shipping smartphones, Venue is making a comeback as a Windows 8.1-running tablet. Dell made the announcement at IDF today. 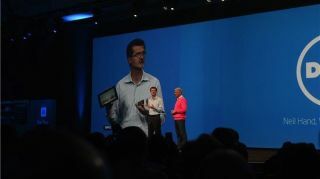 The tablet, as reported by Computer World, will sport an 8-inch screen and Intel's just-announced Atom Bay Trail chip. Both Average Joes and commercial customers can look forward to the Venue bringing better battery life and cellular connectivity. A new day for Dell? Dell plans to offer up more details about the Venue during an event on Oct. 2. The New York City shindig may bring more mobile devices beyond the Venue as well. The company currently produces the Windows 8 Latitude 10, XPS 18 tablet/all-in-one and Windows RT XPS 10 hybrid, all intended for business use. With Venue, Dell will turn to consumers once again, carrying Windows 8.1 - the anticipated update to Microsoft's freshest OS - along the way. How does Bay Trail really perform?